Record-setting high temperatures combined with painfully dry conditions have sparked hundreds of brushfires across the entire Australian continent and Tasmania. Thankfully, no deaths have been reported in this latest round of wildfires, but hundreds of homes have been destroyed, thousands of people have been forced to evacuate, and entire herds of sheep and other livestock have been wiped out. Temperatures have dropped slightly in the last 24 hours, helping firefighters bring many of the blazes under control, but the wildfires and the heat continue to be a danger. Tuesday was the hottest day in Australia's recorded history, with a nationwide average of 104° F (40C), breaking the record set... on Monday. A new individual temperature record of 129.2° F was also set in the nation's interior, forcing meteorologists to intensify their weather maps. Despite the "break" in the weather, the heat wave is expected to intensify again next week. The southern island of Tasmania has been among the hardest hit areas, with at least 128 homes burned down since last week. One couple and their five young grandchildren (all under the age of 11) had to take refugee from the fires by diving into a lake and holding onto a dock for two hours, until they could escape by raft to another location. Grandfather Tim Holmes said, "We saw tornadoes of fire just coming across towards us and the next thing we knew everything was on fire." Australia's most populous state, New South Wales, has lost 500 square miles of forest since yesterday. The fires are so widespread they're bing monitored from space. 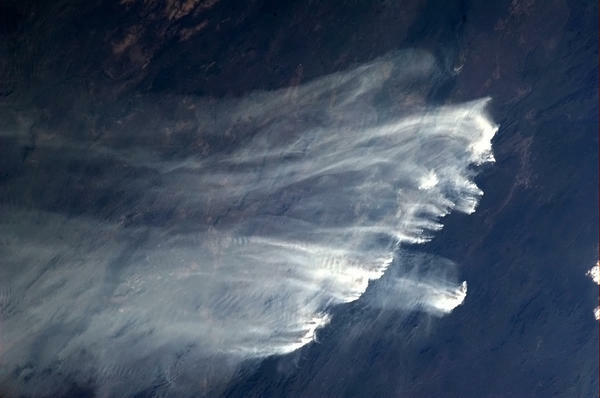 Commander Chris Hadfield, a Canadian astronaut currently on board the International Space Station, has been tweeting photographs of the smoke plumes visible from his vantage point. NASA has also distributed some new satellite photos showing the locations of the fires from high above. In this photo of Tasmania, wisps of smoke mark the wildfires that could be seen by NASA's Terra satellite, which can also detect unusually high surface temperatures. Those are marked by the red dots. Sadly, this latest rash of fires is not a new phenomenon of Australia. In 2009, 173 people died after high winds swept a wave of fires across the state of Victoria, and a similar (though less deadly) scene played out near the Western coastal city of Perth in early 2011. Six months of drought conditions have seen fires break out all over the country during the last year, though conditions have deteriorated even further over the last few weeks, as they head into the peak of the Southern Hemisphere summer. The earlier damage has also been well-documented by NASA, which makes tracking wildfires all across the planet an ongoing project. Using satellite imagery they've marked and cataloged the scars left behind by previous wildfires and in December, the agency released new composite images of the entire Earth's surface at night. This "close up" of Australia was made from photos taken during two different periods in April and October of 2012. The lights on the left half of the picture (away from the coast) are not cities. They're fires burning across the Outback.